Nine stories tall with 225 homes in the heart of DC’s West End neighborhood. Welcome to life at Columbia Condominiums. Whether you’re in one of the building’s one-bedroom, two-bedroom, or three-bedroom homes, you’ll be within walking distance of all the great parts about urban life. There are independent movies (at Landmark Theatres West End Cinema). There’s boutique exercise routines (at SoulCycle West End). There’s nationally renowned Indian cuisine (at Rasika West End). There are cheap and eclectic groceries (at Trader Joe’s). And a little further afield, you’ll be connected to other popular neighborhoods, including Georgetown and Dupont Circle. Many of the units inside Columbia Condominiums have the modern features you’d expect from a building delivered in 2006, including bamboo floors, Sub-Zero appliances, marble soaking tubs, wet bars, walk-in closets, and balconies. Catch some sun during the summer at the building’s rooftop pool and sun deck. Or, enjoy a post-work game of pool in the billiards room. Don’t want to give up Fido for great urban living? At Columbia Condominiums, pets are always welcome. 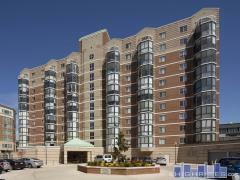 Have any comments or questions about Columbia Condos? Ask your question and/or share your thoughts about this Building. Why are the HOA fees so high in this building? Does anyone know if they include electricity and/or central heating and cooling? The listings for properties in this building are ambiguous on this issue. One states that it uses geothermal heating and cooling, which would suggest a central unit (or units) for the entire building, rather than unit-specific heat pumps.